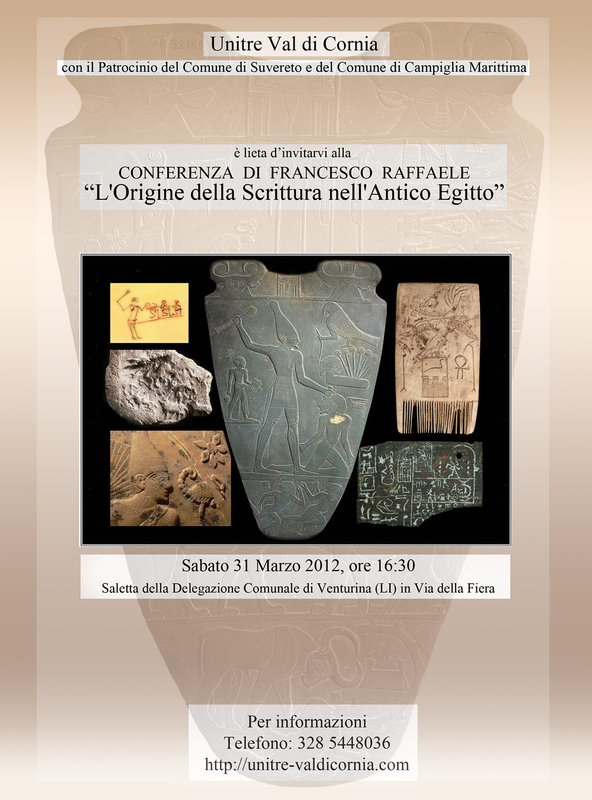 29 Feb 2012: Dopo le date del 2011 a Trieste (Comitato Kemet a Trieste), Imola (Khentyimentiu) e Napoli (A.N.S.E / Archeologiattiva), terrò la mia Conferenza “L'Origine della Scrittura nell'Antico Egitto” anche a Venturina (Livorno), presso la Unitre Val di Cornia, il 31 Marzo 2012. (Locandina in jpg). 9 Sep 2011: On-line my last paper "Animal Rows and Ceremonial Processions in Late Predynastic Egypt" (Published in: "Recent Discoveries and Latest Researches in Egyptology. 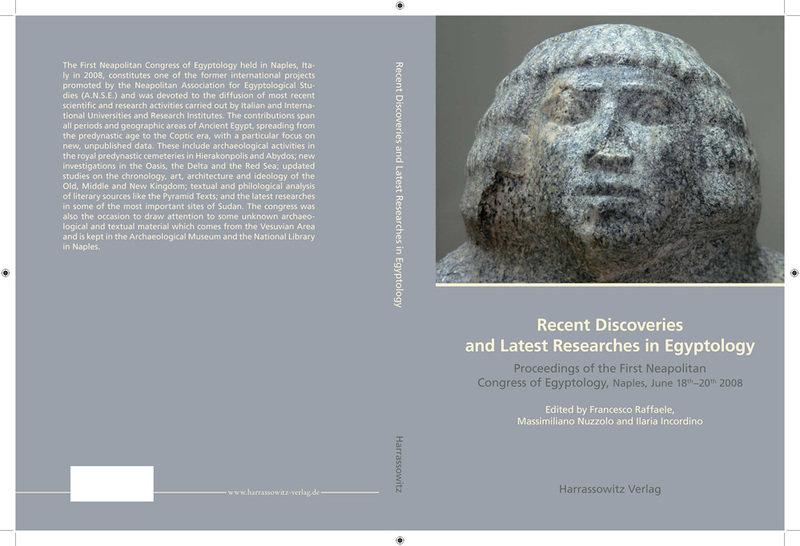 Proceedings of the First Neapolitan Congress of Egyptology, Naples, June 18th-20th 2008". Francesco Raffaele, Massimiliano Nuzzolo and Ilaria Incordino (eds.). Harrassowitz Verlag, Wiesbaden, 2010, 245-285 (NB: the pdf version -which is the same as the published one, is p. 244-283). PDF (red link above) is 4,9 Mb. 3 Feb 2011: My Photo-reportage in Egypt (Dec. 2010). Pt. I.1 and Pt. I.2. 18 July 2010: Ilona Regulski "A Palaeographic Study of Early Writing in Egypt". [Table of Contents]. 24 May 2010: Updated the Links section with the addition of the new Nabil Swelim's website. 20 May 2010: Updated Neferkaseker's page. The Master is going on straight, I have completed my class on Predynastic and Dyn 1-2, and I'm actually doing a 12h presentation on Early Writing in Egypt. Stan Hendrickx's one on Predynastic Iconography has been nothing less than Great! 9 January 2010: ANSE members are working on the final editing phases to finally publish the proceedings of the Naples 2008 Congress. 19 October 2009: Added 2 palettes fragments from San Antonio Museum, late Dynasty 0 (King Scorpion ? - cf. his macehead representations). 19 July 2009: Added 2 papers on Rock Art in Egypt (by J.L. Le Quellec, and J.L. Le Quellec - D. Huyge). Thanks to the authors. 15 July 2009: Added 6 papers (by Takacs, Labridy and Silpa, Gourdine, and 3 by B. Menu). Thanks to the authors and to A. Anselin for the pdf. and a 1995 paper by Oum Ndigi on terminology for numerals in ancient Egyptian and Basaa languages. 19 May 2009: The new Database of Early Dynastic Inscriptions by Ilona Regulski: LINK. 6 May 2009 : One more paper available for download, one of the last Barbara Adams wrote (CCdE 3/4, 2002 - Thanks to Alain Anselin). 21 Apr 2009: Two new papers available for download (one by A. Suzzi Valli and the other by A. Anselin. Thanks to both of them). 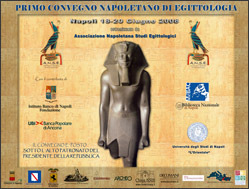 19 May 2008 : PRIMO CONVEGNO NAPOLETANO DI EGITTOLOGIA, organized by ANSE (association of which I am a founding member), will take place on June 18-20, 2008. See the complete programme and (in a few days) the abstracts of lectures. 29 Jan 2008: Finished the Scorpion king page update. Added a palette (with scorpion relief, Kikugawa collection) and some modifications to the corpus. One month since Bastiaan passed away... yet not one day has elapsed without him coming back to my mind. 26 Dec 2007: Mr. Bastiaan Lieffering died today at 59 in his house in Rotterdam. I've been in contact with him for the last four years and he was always a great source of information, ideas, and inspiration with his vast knowledge and vivid passion for Egyptology. Only a few days ago I'd received a book on Egypt as a Christmas Present by him. He was planning to meet me next summer here in Napoli at the ANSE International Congress of Egyptology. He meant to take the opportunity of this Italian journey to visit Palermo, for he'd have wished to see the Palermo Stone with his own eyes once in his life. It's hard for me to describe what I feel: the fact that I miss him so much evidently depends on something which goes well beyond our common interests. He was really a great person, a true gentleman and I feel lucky to have been someway in touch with him, to have learnt from him... I'm very sad that fate's taken him away so untimely. R.I.P. my friend. 25 Dec 2007: Major update to the page of king Scorpion (II). Corrections (mainly in raw sentences structure and typos) in Djoser page. HAPPY CHRISTMAS. 24 Dec 2007: Check the PDF of the magazine "Expedition" of the Pennsylvanya University (search for "Egypt", "Abydos", "O'Connor" or see the index). KOFLER - TRUNIGER (Lucerne / Luzern) Swiss collection. If you know anything, please write me to the e-mail address below. 24 Nov 2007: In this period I am working on the ANSE website. I am one of the 4 founding members of this association and we are organizing an International Congress of Egyptology for June 18-20 2008, in Napoli (Italia). - The server troubles which have lasted for 2-3 weeks (October) have ceased. So for now this website remains on virgilio/alice web-space. 24 Oct 2007: In these days the xoomer-virgilio-alice servers are not working properly. Pages and images of this site often seem to be missing, although, after some refresh (key F5) or going back from the "missing file page", they do reappear... I'm moving the whole website to my new domain. 16 Aug 2007: Updates in some 2nd and 3rd Dynasty kings' pages, most notably: Wneg, Sanakht, Sekhemkhet. 03 July 2007 : Added 3 labels of Semerkhet into the corpus (Thanks to Mr. Bastiaan Lieffering for image and data on label Semerhet 6). 19 Mar 2007: Acquired the domain www.francescoraffaele.com (my website is 70Mb and I had only 30 Mb left on the present free web-space). 19 Sept 2006: Added a long paragraph to the Saqqara page on the Great rock cut Trench / Dry Moat around Netjerykhet Step Pyramid Complex. I have also inserted an enquiry in the main page to obtain any kind of information about the early Egyptian objects in the ex Kofler-Truniger collection. 09 Aug 2006 : Review (in Italian) of N. Barca book "Sovrani predinastici egizi". Updated 3rd Dyn. page of Nebkara . 19 June 2006: Link to the Abstracts of the Toulouse "Origines" 5-8 September 2005 Conference (PDF, 900 Kb, 131 pages, at http://origines2.free.fr/ ). 15 June 2006: Updated the Labels introduction (and some single labels bibliography). 29 May 2006: I'm writing a long page on the Origin of Egyptian State, that of Khasekhemwy and one on some animals in LP-ED Egypt. I have updated the page of Ninetjer and made minor additions to others; added bibliography to the corpora / objects (palettes, labels, stone vessels). I am currently reading Hendrickx et al. (eds. ), Egypt at its Origins, a monumental publication, which I recommend to all those who are interested in this period, literally overflooding with its abundance of new excavation reports and studies (index at the bottom of this page: Cracow 2002). The website has now a new URL: http://xoomer.alice.it/francescoraf/ but the other one "xoomer.virgilio.it/francescoraf/" should remain active. 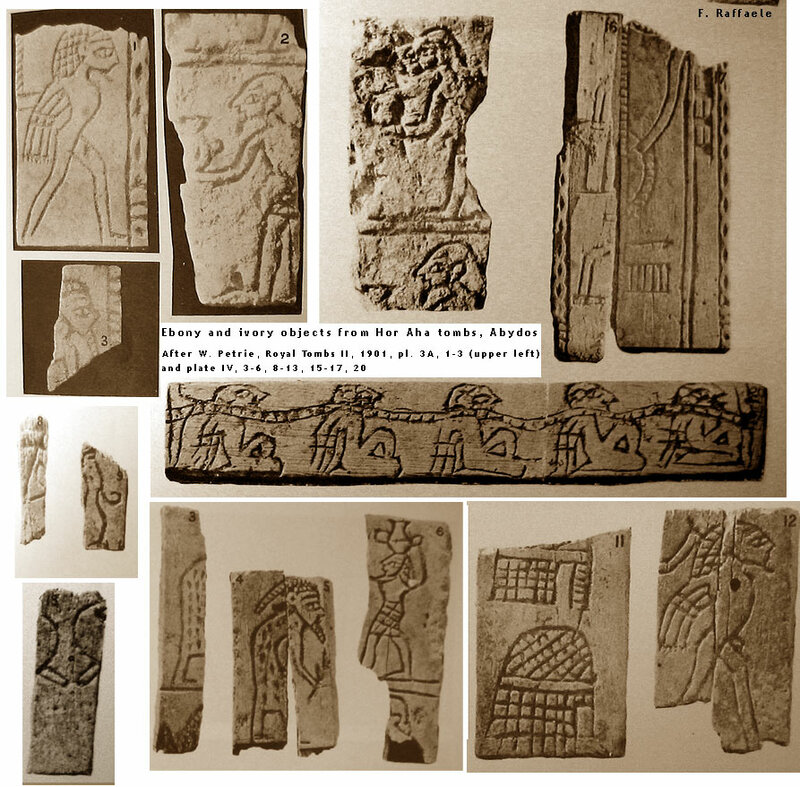 14 Mar 2006: On-line readings: W. Davis, Archaism and Modernism in the Reliefs of Hesira. PDF - J.O. Gransard-Desmond, Canids. 19 Oct 2005: A review of the Toulouse "Origines 2" international conference on State Formation in Egypt (by G.J. Tassie, UC London). 06 Oct 2005: Added a Naqada IID-IIIA palette into the corpus (Thanks to Geoffrey Tassie). Added images of the earliest Egyptian seal impressions. 14 Sett 2005: Online two articles I have published in Cahiers Caribéens d'Egyptologie 7-8, 2005, p. 27-46, 47-60. Thanks to Alain Anselin. I am still studying Greco-Roman Archaeology (yes it's some months now...) after which I'll discuss my Degree thesis. Meanwhile, I'll present a lecture on "Causes and Effects of the State Formation in Ancient Egypt, Late Predynastic to Early Dynastic" on October 13 in Barcellona, for INDETEC-AEGYPTUS. Thanks to Juan de la Torre Suárez and Teresa Soria Trastoy of ASADE ( Egiptomania.com ). 31 Mar 2005: BIFAO issues 1-80 on line in PDF. 25 Mar 2005: Index of the Cracow 2002 International Conference proceedings: Egypt at its Origins. Studies in Memory of Barbara Adams. 19 Mar 2005: New program of the lectures for 2005 at CISE. 29 Jan 2005: I wish to thank the staff of the Giza Archive Project and the director Peter Der Manuelian for the excellent database they have recently made available on-line (GIZA DIGITAL LIBRARY): publications (both articles and books), manuscripts, a photographic archive and multimedia material. The Boston MFA (and Harvard University) website has thus become one of the richest sources on the Internet for Egyptologists, providing full electronic (downloadable in PDF) versions of the Giza Mastaba Series (vols. 1-7) and monumental publications as George Andrew Reisner's "A History of Giza Necropolis" vol. I-II and Mycerinus (H. Junker's and S. Hassan's Giza reports series are also planned to be included in the future). In addition, there are several downloadable articles by Reisner, W.S. Smith, Dunham, Der Manuelian, Lehner and by many other scholars (browse the alphabetic authors index); I would also like to signal Andrzey Cwiek (2003) PhD Thesis "Relief Decoration in the Royal Funerary Complexes of the Old Kingdom" (454 pages, 98 figures), P. Der Manuelian "Slab Stelae of the Giza Necropolis" (2003) and B. Porter & R. Moss, "Topographical Bibliography" III.1 (1974). In the modern context, with so many new publications often very difficult to examine (journals, monographies and proceedings: it is quite impossible to buy everything which is published yearly, even for libraries), we cannot but sincerely applaud the Giza Archive project and any similar enterprise (read Chicago O.I. ABZU, University College London, Friends of Nekhen, The Global Egyptian Museum and some more) which allow scholars and 'aficionados' to consult important works or to virtually visit Museums' whole collections with no further expense of time and money. Another invaluable achievement and a benefit for the pure and unrestricted scientific learning and research. 3 Nov 2004 : Some updates in palettes/labels bibliographies. 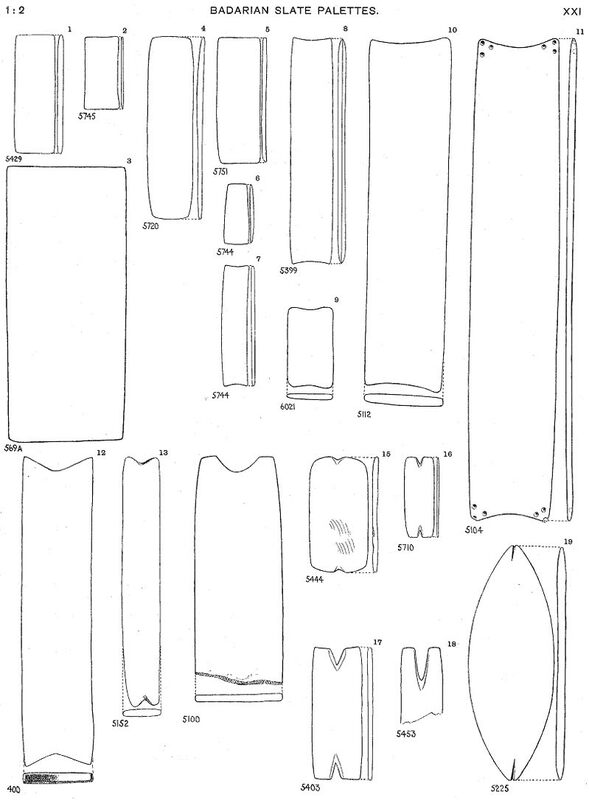 Added label Den 42 new fragment; ivory box fragments of Narmer (bottom of the page); new found C-ware vessels, and the 'Moscow bowl'. - Alejandro Jiménez-Serrano, La Piedra de Palermo: traducci�n y contextulaizaci�n hist�rica. AEDE, Madrid, 2004 (cost: 15 Euro; available HERE). - Ludwig D. Morenz, Bild-Buchstaben und symbolische Zeichen. Die Herausbildung der Schrift in der hohen Kultur Altaegyptens. Orbis Biblicus et Orientalis 205, Fribourg Academic Press. I wish to thank Bastiaan Lieffering, John Degreef and Stan Hendrickx for the material they have kindly sent me this month. Finally, please e-mail me if you get any "Pop-ups" or other problems in accessing my website. 29 Sep 2004: Few time for the website while studying my last exam (Graeco-Roman Archaeology and Art History). Check out the old and new Nekhen News issues recently put on-line at hierakonpolis-online.org (resources page). 07 Aug 2004: Added a large commentary to the label Djet 16. Inserted in the corpus a label of Hor-Aha and one of Den (?). NOTE: sometimes when I browse my site pages on-line it happens that some images are not completely displayed. This is caused by low band not by damaged or incompletely uploaded images. When this occurs you only need to reload the page (pressing F5) and the images will appear integrally. Also repeatedly press F5 if the MAIN PAGE of the site should not appear (and a Oops! - misssing file page appears). 06 July 2004 : The counter hits 100.000 accesses to the main page of the site (50.000 since November 2002). Many thanks to all of you. 16 June 2004: No Egyptian material for this update: Image Galleries of some long excursions with the association of Lerka Minerka. 09 June 2004: Completed the page on early Egyptian queens and princesses. Added tomb S3503 in the Saqqara page. 19 May 2004: Inserted 1 label of Aha (Aha 11), 10 of Djer (Djer 12-18), a new fragment of Djet label n. 16 (MDAIK 59), and 2 of Den (Den 56-57), a new photo of Djer 5. Ivory carvings of Narmer-Aha. 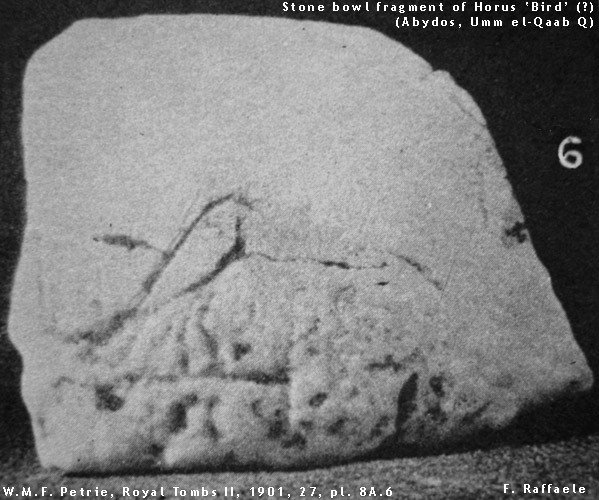 A photo of the stone bowl fragment of Horus Bird(?). (Most of these pics after Petrie, RT II extra plates). 29 Apr 2004: A short page on Early Dynastic Royal Women (princesses, queens) come out of an e-mail I've sent to A. Eyma's EEF. Inserted 2 images with annalistic ink-inscriptions on stone vessels from Saqqara and beer jars from Elephantine (cf. Stone vessels corpus). 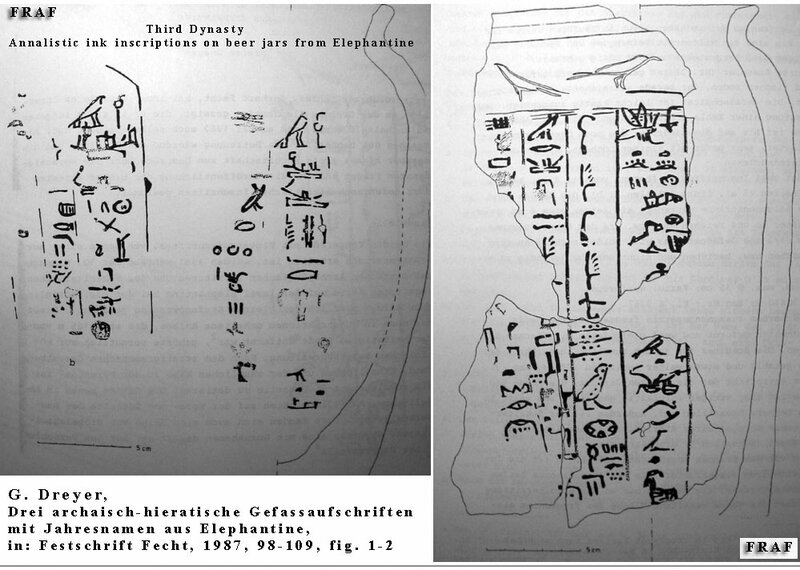 (Thanks to John D. Degreef for sending me -some years ago- a digitized copy of Dreyer's FS Fecht 1987 article on the Elephantine inscriptions). 16 Apr 2004: Inserted a larger image of the Louvre ("Four Dogs") palette , a better one of the Plover palette and more Naqada I-II palettes. 29 Mar 2004: Updated the introduction text of the Palettes corpus. Updated the CISE program of Egyptology lectures for 2004 (see the red link above). 19 Mar 2004: Origins of the Egyptian State: from Predynastic to Pyramids (detailed sketch of my lectures in Imola and Faenza, February 25-26, 2004). This is a very important work on the Nubian A-Group, efficaciously summarizing the archaeological campaigns (chapter 2), economy and subsistence, burials and burial practices, social complexity, material culture, settlements and cultural decline (ch. 3), origin (Qadan, Abkan, Post-Shamarkian, Khartoum Variant and Dongola Reach early cultures) and relationships/foreign contacts (Early and Neolithic Khartoum; Butana, Atbai, Gash; Wadi Howar; Deserts and Oases; Gezira and other sites south of Khartoum) (ch. 4). A great synthesis which also achieves interesting new insights with regards to the early development of A-Group and its interaction with contemporary close and distant cultures, both Egyptian and Ethio-Sudanese ones. The old links http://members.xoom.it/francescoraf/ and http://members.xoom.virgilio.it/francescoraf/ will still work, redirecting to the new URL. Note that the external links to subpages of my site (in other websites and web search engines) will not work if they still retain the old urls. Also note that if you have Internet Explorer "protection"-settings on high level, it could be impossible to enter the site (the upper bar will duplicate until filling up the whole screen), so you must set the internet protection on "average" level. The problem is caused by the blocking of COOKIES: if these are disabled by the browser's high level of protection settings or by a Firewall, you won't be able to visualize this website pages at all. 03 Feb 2004: I am preparing a lecture on the origin of Egyptian State which will be presented at CISE (Imola) and Faenza (Rione Giallo), late this February (see link above). This, along with my last exams and thesis at University, will necessarily decrease the time I can dedicate to this site, so the updates will not be as frequent as in the last years. However, after the lectures, I will probably insert a new page on the origin of Egyptian State based on the text of my conference (both in Italian and in English). Later on, I plan to accomplish 2nd Dynasty Peribsen's and Khasekhemwy's pages and to totally re-elaborate the First Dynasty kings' pages (which in their present state are nearly all very old/ingenuous in their layout and text). I want to sincerely thank Teresa Soria Trastoy and Juan de la Torre Suárez for sending me the first volume of their research on the Amarna history and archaeology: Tell el-Amarna (Vol.1), Las Tumbas Norte: Huya, Meryra II, Ahmes, Meryra, Penthu y Panehesy (Ediciones ASADE, Sevilla 2003). The book is introduced by three chapters which summarize the political, religious and artistical characters of the Amarna period state. The core of this study are the six northern private tombs, the architecture and decoration of which is discussed in more than 70 pages and illustrated with line drawings and maps. Some of the drawings are of great importance for they represent reliefs portraying the royal family, the Amarna temples, the royal palace, court rituals and ceremonies. The contents of the publication is not limited to the paper pages: a CD-Rom is included which supplies the photographic repertory of the publication, with several photos (mostly full screen at 800x600) of the area of the tombs and their interiors, especially the decorated walls (related to in the text foot-notes). The photos are introduced by a solid multimedia presentation opening with a map of the tombs area, the html version of the tomb chapters included in the book, and more than 390 photo images, each with an explicatory caption, illustrating the locus or the reliefs' details. The Cd also comprehends a brief study of five of the boundary stelae with translation (and digitized transliteration) of the best preserved one. Congratulations to Teresa Soria and Juan de la Torre for this interesting work and for their passion and activity as ASADE and through the outstanding websites Egiptomania.com and http://www.antiguoegipto.com. 03 Jan 2004 : Translation and commentary of a label of Horus Qa'a (corpus nr. 16). 01 Dec 2003 : Updated the page of the Cracow 2002 Conference on the Origin of State in Egypt: added the contents of the Proceedings volume. 29 Nov 2003 : Hierakonpolis tomb 100: a medium resolution color image of the c. 5500 years-old painted decoration from this tomb. Two plates into the Palettes corpus: Badarian and Naqada I-III palettes from Badari (Brunton/ Caton Thompson, Badarian Civilisation, pl. 21, 52). Added a page into the Palettes Corpus with 20 predynastic palettes shown at their proper scale. 21 Nov 2003 : Updated the page of the Hathor/Gerzeh palette with some short notes. 16 Nov 2003 : Inserted a picture of the reconstructed Hathor stone bowl from Hierakonpolis. See it in the page of the Gerzeh Palette. Updated the image of the Gebelein-linen with a better scan of the central barges (thanks to B. Lieffering). Inserted a group of late Naqada IIC objects from Gebelein (?) in Cairo Museum (JdE 34210=CG 64868 and others after Quibell, ASAE 2, 1901, 131f.). 15 Nov 2003 : Inserted a painted box-like jar from el-Amrah atop the image Gallery 7.4. 13 Nov 2003 : Inserted a palette: Ka-palette from Helwan (early First Dynasty). a page/image of the Painted linen from Gebelein (Torino, Museo Egizio, inv. suppl. 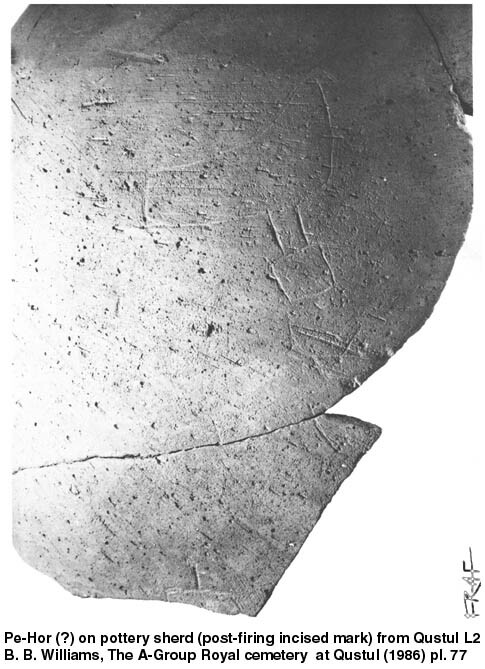 n. 17138) and the photo of the Gebel Sheikh Suleiman minor graffito. 3/4 Nov 2003: Updated the Dynasty 0 Serekhs table and added an introduction on Serekhs to the same page. Inserted my article Dynasty 0, AegHelvet 17, 2003, 99-141 (Downloadable in PDF format). Inserted 6 labels of Horus Qa'a (nr. 19-24) and 1 of Horus Semerkhet (nr. 5). Inserted two more palettes into the corpus [Late Naqada I Barbary goat palette and Early Naqada III (?) Louvre bird-palette]. Small updates and additions to the text of many pages of the site. 29 Sett 2003: New issues of Nekhen News available on-line in PDF format on the Friends of Nekhen website at http://www.hierakonpolis-online.org. 05 Aug 2003: Added three images of palettes in the corpus: Ashmolean 1895.855 and 1895.841 plus a new image of the MMA palette with serekh. Many Thanks to Juan de la Torre and Teresa Soria for the permission to use their photos in my site. See their huge site Egiptomania.com and the Cairo Museum images..
29 June 2003: Added a picture of the Abydos tomb U-239 vessel (C-ware) with its decoration (Image Gallery 7.4). 22 June 2003: Added some images into Khasekhemwy's page. I'm studying for an exam in these weeks. 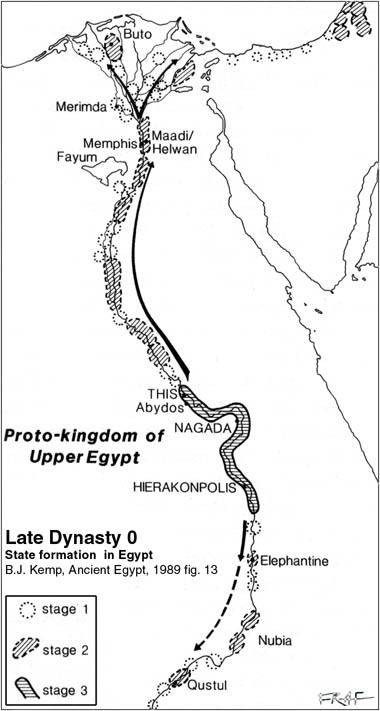 14 June 2003: I've decided to extend the name of this website to: "Late Predynastic and Early Dynastic Egypt" according to its contents and my interests, which actually span from Badarian to Dynasty 3. I have finished the text of the palette fragment from Abydos tomb B19 (Hor Aha). 05 June 2003: Added 9 plates of Petrie's corpus of Palettes in the palettes page (see the table after the introduction). Voglio ringraziare di cuore il CISE di Imola ed in particolare Laura e Meri, Giorgio e Marialuisa, Flavio, il presidente Casadio. Un saluto anche a Michel e Natalie Baud. Siete stati tutti simpaticissimi e pieni di pura e vitale passione egittologica. A presto. 29 May 2003: Added 8 more pages in the palettes corpus and a total of 16 new images of palettes. New pages are: 4 U.C. 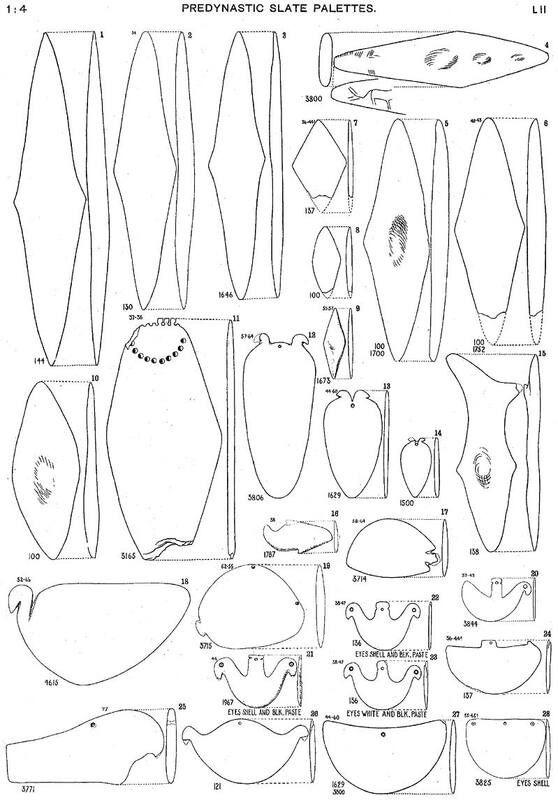 Naqada I palettes, Min Antelope Cairo pal., Gerzeh pal., UC Hartebeest fragm., Wien fish pal., 2 Swiss pal., 3 Tarkhan Cairo pal., 1 Tarkhan U.C. pal., Narmer pal. sketch in Cairo and Abydos B19 fragment. 19 May 2003: Added 6 labels of Horus Qa'a in the corpus (Thanks to Bastiaan Lieffering for the color scans of 5 of them). 02 May 2003: Added a picture (with plans and photographs) of the stepped-core Mastaba S3038 in the page of Saqqara. 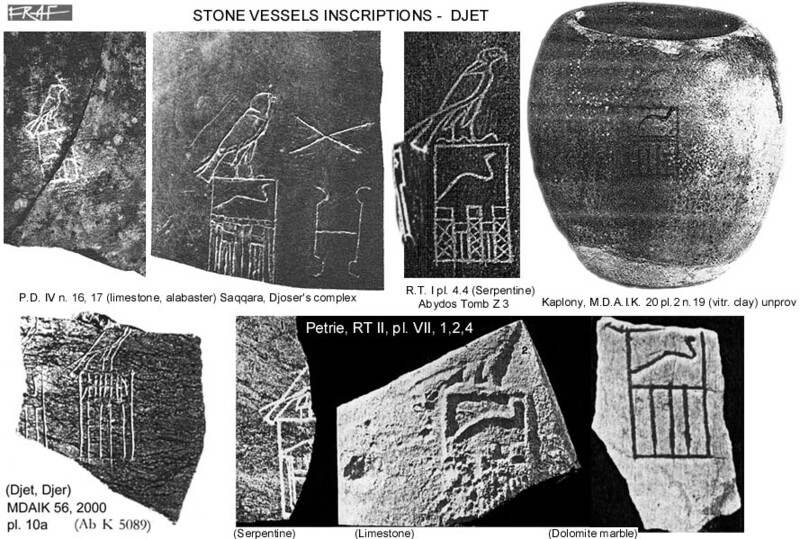 23 Apr 2003 : Added four serekhs into the image of Djet's stone vessels inscriptions. > New finds from late First Dynasty. 19 Apr 2003 : Review of Jiménez-Serrano "Royal Festivals"; updated the Labels intro; gallery of snakes (?!?). CISE page. 09 Mar 2003 : Inserted the first part of a page on the Abydos Royal Enclosures (to be further corrected and completed). Next update will be the Review of an important book published few months ago: A. Jiménez Serrano's "Royal Festivals". 11 Feb 2003: Article: On the terms "Dynasty 0" and "Dynasty 00"
26 Jan 2003: Inserted a higher resolution image of the Bastet inscription on stone vessel fragment from the Smith Collection. ***New books uploaded in Abzu/Etana (in PDF format): W.M.F. Petrie, Prehistoric Egypt (1920); Petrie, Tarkhan I and Memphis V (1913); W.M.F. Petrie - J. E. Quibell, Naqada and Ballas (1896), J. E. Quibell, Hierakonpolis I (1900)***Search the index for more. 20 Jan 2003: Some additions to the Bastet inscription article. 19 Jan 2003: Short article on an inscribed stone vessel fragment with the name of the goddess Bastet from a private collection. 13 Jan 2003: Review of M. Baud's "Djéser et la IIIe dynastie". Updated the pages of Djoser and Ba. Inserted three pictures in the Image Gallery 6 (Narmer/Aha, Djoser at Wadi Maghara, Djoser at Heliopolis). 03 Jan 2003 : Inserted a new Image gallery (gallery 7.4). Updated the Serekhs page adding a table with serekhs figures. 19 Nov 2002: Slight updates in the Dynasty 0 and Dynasty 00 pages. Inserted a line drawing of Qustul L23 bowl painting. Inserted a photo of the serdab-statue of Djoser (photo by Jon Bodsworth from his splendid website THE EGYPT ARCHIVE). 16 Nov 2002: Updated the "Dynasty 00" page. 12 Nov 2002: The site has recorded 50.000 accesses to the main page since its birth! 09 Nov 2002: "Dynasty 00". 03 Nov 2002: Updated the Predynastic synthesis. (In the next days the "Dynasty 00" page will be completed). Djéser et la IIIe Dynastie (Ed. Pygmalion, Paris) by Michel Baud (whom I thank for presenting me his book) is an important synthesis on this obscure period, in which only the reign of Netjerykhet (Djoser) and the impending figure of Imhotep seem to shine in the light of their important achievements (especially the magnificient Step Pyramid complex of Saqqara); but many other aspects of this fashinating age are passed in review by the author as well as the monuments of the other rulers of the Dynasty and of the main officials. More than 300 pages of pure extasis for those who love this period, bridge between the Archaic state of Dynasties 0-2 and the mature, grand nation mirrored by the Old Kingdom pyramids. I cannot say more because I ve received the book few days ago and I am still in the middle of this exciting work. Certainly the 3rd dynasty pages of this website (which is honoured by the mention in the bibliography of the book) will be enriched by the plenty of data, hypotheses and improvements that M. Baud has offered to the knowledge of Djoser's and his immediate successors' reigns. La nascita dello stato nell' Antico Egitto: La Dinastia "Zero" (Ed. La Mandragora, Imola) by Silvia Vinci is an up-to-date synthesis of the state of the question concerning this period (based on the author's degree thesis). It consists of three parts: the first one summarizes the studies and the excavations connected with the Late Predynastic period and also introduces the datation/ chronology and terminology problems. Part Two is devoted to the presentation of the main archaeological sites which have produced documentation related to the "Dynasty 0". Part Three deals with the State formation, royal serekhs, monumental architecture and divine kingship; a conclusive paragraph ends the book. The text is precise and fluent and the author very well documented on the subjects she faces: my congratulations to Dr. Silvia Vinci for this brilliant synthesis (and many thanks to Mrs. Laura Degli Esposti for sending me this book). 10 Oct 2002 : Added the description and pictures of tomb S3500 (reign of Qa'a) into the page of Saqqara (in Part II). 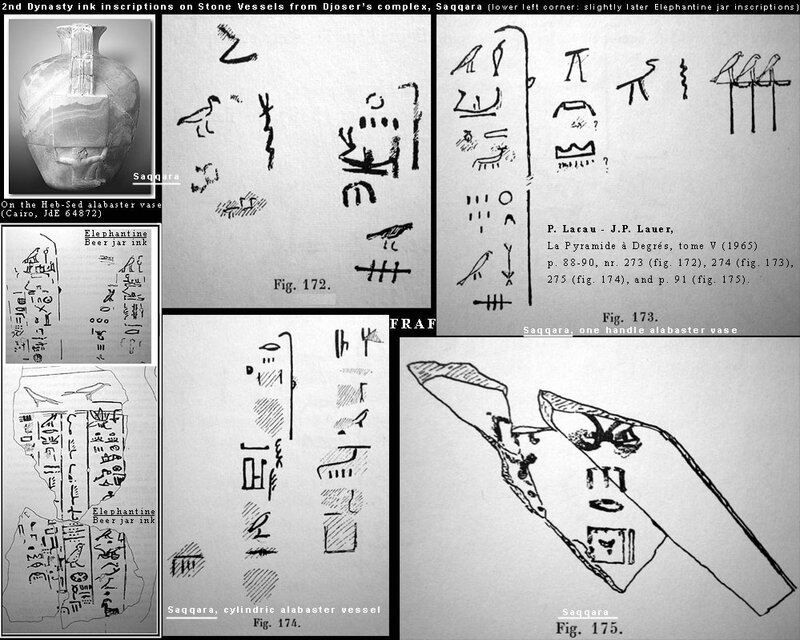 09 Oct 2002 : Added line drawings of the inscriptions on Khasekhem's statue bases. Some minor updates in Djoser page. 22 Sept 2002: Added a new photo of the verso of the Hierakonpolis-Ashmolean Mus. palette (thanks to Rita di Maria). 09 Sept 2002: I am delaying the announcement of the Cracow Conference page because there are some problems with the XOOM advertisement bar; this doesn't depend on me and it affects all the Xoom.it sites: since the bar has been modified (c. 10 days ago) some internet browsers (or some Windows versions ?) cannot access any page of the site because the bar duplicates until it fills up the screen. I hope the Xoom staff will rapidly fix the bug, but if you are reading this lines it means that you won't have any problems for that. 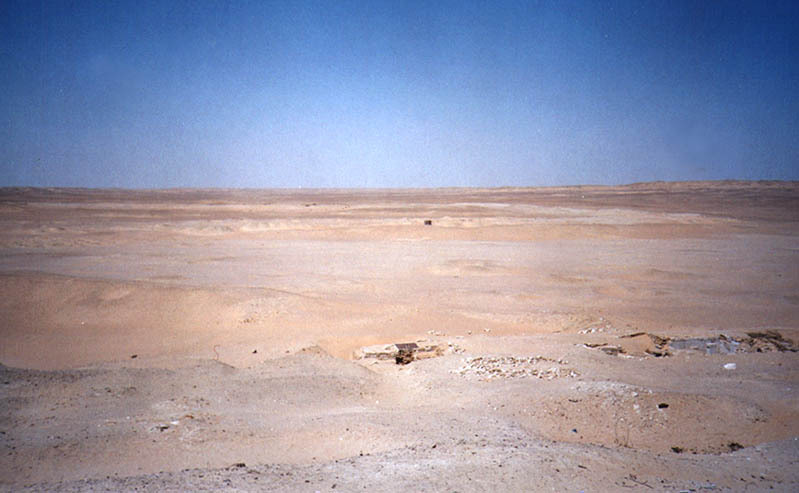 03 Sept 2002 : SAQQARA. Actually the introduction only spans Dynasty 1-2, but I'll add the 3rd Dynasty and more parts. In the next days my site will officially host the Cracow 2002 -International Conference on the Origin of the State Abstracts. 19 Aug 2002 : New (hi-res) picture of the Palermo Stone (recto, line 1-5). Updated the page of Netjerykhet/ Djoser. 01 Aug 2002 : The new link added to Bodsworth's new site THE EGYPT ARCHIVE deserves also a mention herein. 26-June 2002: Barbara Adams is dead by an esophagus cancer. Her contribute to the knowledge of Predynastic and Early Dynastic Egypt studies equals that of the greatest names of Egyptology. Thank you and R.I.P. Condolences to her family. 20-May 2002: Inserted a new Image Gallery page with monuments from my site pages. Excerpted the page of Scorpion II. 19-May 2002: Updated the page on Stone Vessels. Updated the page of Cahiers Caribéens d'Egyptologie (n. 3/4 index). 18-May 2002: Updated the page on "Dynasty 00". 15-May 2002: Added two summaries of monographies by Dr. Dmitry Proussakov in the articles section (Proussakov). 11-May 2002: New section with Late Predyn./Early Dynastic articles by other scholars downloadable in PDF format. CCdE. 22-Apr 2002: Added a photo of the Manchester palette and two of the Ashmolean palette. Updated Stone Vessels page text. 19-Apr 2002: Updated the page on the new Second Dynasty royal tomb found and excavated at Saqqara (2nd half of the page). 15-Apr 2002: Added images and links on the Saqqara Second Dynasty tomb substructure (Thanks to Dr. Ren� van Walsem). 02-Apr 2002: Added a new photo of the Lucerne fragment of the Battlefield Palette and a new Stone Vessel inscription (at the bottom of the linked page) - Thanks to Mr. Peter Hardy for both the scans. Due to ongoing procedures of optimization on Xoom.it servers, this website pages may be still very slow to appear in certain moments. 23-Mar 2002: I am working on a new version of "Dynasty 0" for publication in Aegyptiaca Helvetica. This will be dowloadable in Doc format on this website after it has been published. Later I'll go on with Saqqara, Khasekhemwy and Dynasty 00 pages. The site seems fast now, but in some moments of the day it could still be slow in appearing. 11-Mar 2002: Xoom is still working to optimize its servers; therefore for some days more the site may download very slow in certain hours. 05-Mar 2002: The site and Xoom.it is now totally efficient again, also in speed. Slightly changed the Main page. 28-Feb 2002: Due to a fire in the Xoom.it Servers-house, the site has been off-line for a week. Now I have made the full upload of all the files again; please, inform me of eventual missing images or dead links. 16-Feb 2002: In this period of few updates (owing to my Universitary/Egyptological studies) the site has recorded 30.000 accesses. Many Thanks to all those who have found this site interesting and have encouraged me to go on with my passion. I m sorry that I couldn't yet complete the page on Saqqara, on which I ve already written a lot last October. I ve decided not to upload it fragmentarily, but only when it ll be full ready. In the meantime there has been a little change of URL of the site (you'll notice an additional "virgilio" in the Xoom.it address), but this is all automatic and you don't have to change the Bookmarks (luckily for me). Finally: some pages are written without tables to frame the text, so the Xoom bar above (which doesn't depend on me) 'stretches' the text in the pages up to the very edge of the screen. To avoid this you must insert "_XOOM/" in any URL of my site before "francescoraf/"; for example this page which is http://members.xoom.it/francescoraf/hesyra/updates.htm must be written http://members.xoom.it/_XOOM/francescoraf/hesyra/updates.htm to see it without the upper bar and therefore with the text more distant from the edge of the screen and easier to print. 25-Jan 2002 : Short summary notes on Horus Den. 13-Jan 2002 : Update on new discoveries by the MacQuarie University team excavating at Helwan. 23-Nov2001 : A New Second Dynasty Royal tomb at Saqqara ? 14-Nov2001 : Inserted some images in Khasekhemwy (still in preparation), Pe Hor (?) from Qusul L2 and a Dyn 0 map. 28-Oct 2001 : Updated the page on the South Saqqara Annals of the Sixth Dynasty. 21-Oct 2001 : Today the site has recorded the 20.000 accesses (into the main page) after 1 year and a half since its birth. 03-Oct 2001 : Added 5 palettes and updated many bibliographical references in other palettes pages; addit. to the Pal. intro. 27-Sept 2001: Added a hi-res photo of the Cairo fragment of the Cairo-Brooklyn palette. 21-Sept 2001: Added the "Archaic Horus" incense burner in the Dynasty 0 page. Updated the text of Dynasty 0 page. 06-Sept 2001: Added a lot of Naqada IIIab images; they will all be available through the Dynasty 0 page since tonight. 03-Sept 2001: Inserted in Dynasty 0 page some more scans (in the table below); almost completed the Dynasty 0 text. 31-July 2001 : Modified the Home page and added an Introduction and INDEX to the site. 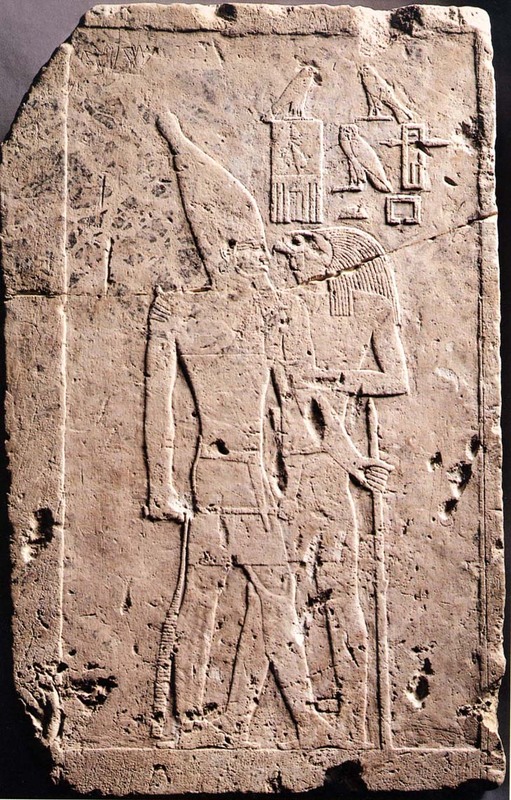 30-July 2001 : Added the page of Sekhemib - Perenma'at; Scanned the Abydos stela of Qa'a now in Philadelphia. 25-July 2001 : Little update to the Stone Vessels inscriptions (text); working on the files of the last kings of the 2nd dyn. 22-July 2001 : Little text updates in the Third Dynasty page (Kaplony's PL) and to the kings. 19-July 2001 : Added Naqada I-III pictures in Gallery 7 and a little update into Helwan page. 18-July 2001 : Added 5 statue-statuettes into the Image Gallery 2; added a pic in Huni 's page. 13-July 2001 : Little Update in Sanakht page. 12-July 2001 : Updated Nebkara, Nebka - Sanakht and Huni (Abu Rawash Mudbrick pyramid and El Dair enclosure). 12-July 2001 : Updated the Image Gallery 2 inserting the Coptos Colossi and the Hierakonpolis limestone statue. 11-July 2001 : Minor updates to the pages of Zanakht - Nebka and Sekhemkhet. 10-July 2001 : Few further (minor) updates to the page of Khaba. 09-July 2001 : Added the 'Double Bird' palette to the Corpus, and resettled some image galleries with the new 3rd dyn pics. 08-July 2001 : Updated the page of the Third Dynasty king Sanakht - Nebka. 06-July 2001 : NOTE: the THIRD DYNASTY Kings section has been split: each 3rd dynasty King has now his own page, which will be updated, whereas the text of the kings' chapters in the main 3rd dyn. page will not. Khaba and Nebkara-Neferka pages have been already almost completely renewed and some (old) photos have been added in that of Djoser. 29-June 2001: Few updates in this period (I'm studying for an exam of History of religions): The site servers have been moved from California to Italy: now the past days troubles should definitively cease (I really hope so). In this period the site server is seldom working at full-time! All the sites on Xoom.it, including this one, are often obscured for maintenance. 13-June 2001: Added 6 new photographs of Ist and IInd dynasty stelae in Gallery 6. 13-June 2001: Djoser's Complex photo-gallery is becoming something different and a little bit harder to develop. It will be a page of its own dedicated to that wonderful monument, but I ll have to work on it for longer time; it will be online before the pages on the North Saqqara Archaic Mastabas, but you ll have to wait a little more than few days. Note: I am sorry for sometimes the site is off-line (error 404) or it displays pages without some pictures or it downloads slowly: this is due to the Xoom servers maintenance, but luckily it happens only few times each month. 23-May 2001: Added 10 galleries of images from my site and from others + new scans of my photographs in Egypt. 11-May 2001: Added the Elephant, Hands and Neith palettes to the Corpus (linked below). 06-May 2001: Added some more references in the Palettes Corpus, and a photo of the Manshiyet el Ezzat palette. 04-May 2001: Added a palette in the Geneve Barbier-Mueller Museum to the corpus. 25-Apr 2001 : Future projects - It's always hard to speak about my aims (with the last exams at University and the Degree Thesis in preparation): First I should prepare the final sketches of the pages of Sekhemib, Peribsen and Khasekhemwy of the IInd dyn. And I m thinking to a third corpus too: Late Predynastic and Protodynastic decorated Palettes. In the meantime I m preparing a work on Saqqara Early Dynastic Mastabas; in particular those nearby the Step Pyramid compl. and the ones in North Saqqara. I m copying and pasting the Mastabas' plans onto the Cairo H22 (Saqqara map 1:5.000); and I have taken about 20 photographs of the almost completely buried mudbrick mastabas of the Ist Dynasty which I ll scan and add to this page. Maybe I ll continue the Little Museum or I ll add a Photographs' Album with the shots I ve taken in Egypt in the two months I ve spent in Egypt (12Febr. - 12 April 2001). Finally the IIIrd Dynasty page should be updated with photos, plans of other monuments and text from some new articles and from others which Dr. Nabil Swelim kindly presented me; I regret the fact that the earliest dynasties (0 and I) are still too badly represented in my site and I d need much time to make a worthy resumee' of the Dynasty 0 and at least translating into english the brief accounts on the Ist Dynasty Kings (which really need to be completely rewritten according to the new findings). 18-Apr 2001 : Updated the page 'Stone Vessels Inscriptions' (added pictures and intro). 16-Apr 2001 : Added references to the pages of the Labels' Corpus and 1 label in Djer's and 9 in Den's section. Added photo in Hotepsekhemwy, Gisr El Mudir and Djoser's complex (from the Entrance Colonnade). 1 - Feb 2001 : Added Stone vessels inscr. pictures of Qa'a (2 pictures), so ending the page on Stone Vessels Inscriptions. 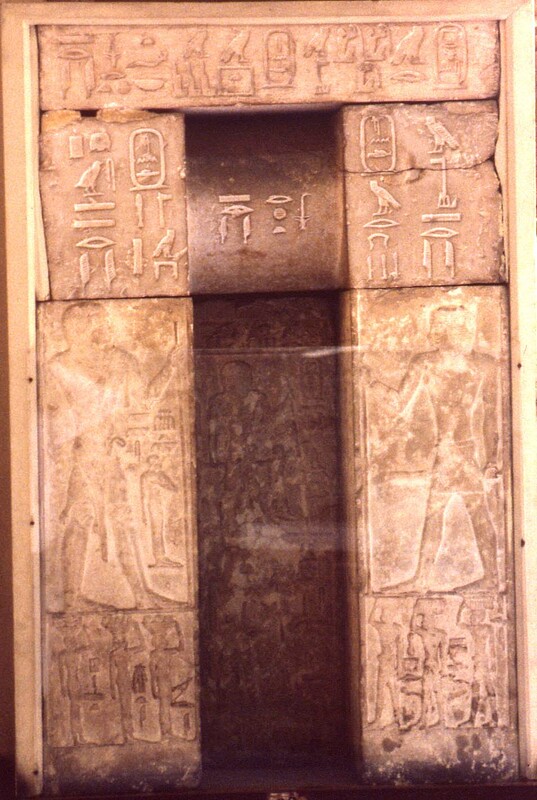 27- Jan 2001 : Added the plan of the tomb of Ninetjer at Saqqara (B) (Kaiser, 1992); modified the plan in Hotepsekhemwy. 25- Jan 2001 : Added Stone vessels inscr. pictures of Adjib (2 figures). Only 2 figures of Qa'a remain to be added. 24- Jan 2001 : Brief summary of Dynasty 0 and "00". Preparing Adjib's pictures. 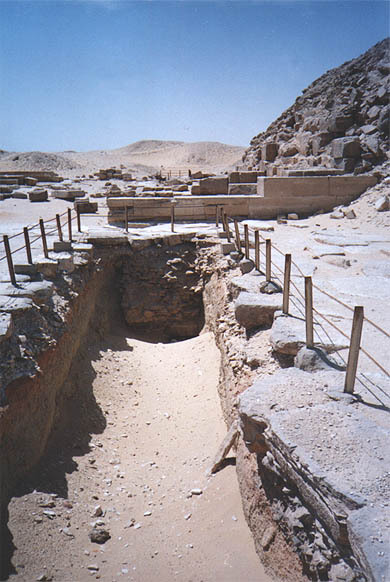 24- Jan 2001 : Updated the News on Abydos boat-graves. Preparing Adjib's Stone vessels inscriptions pictures. 22- Jan 2001 : Added Stone vessels inscr. pictures of Den-Khasety - Adjib/Merbiape - Semerkhet/Iry Neter - Qa'a in serie. 20- Jan 2001 : Added Stone vessels inscr. pictures of Semerkhet. 20- Jan 2001 : Added Stone vessels inscr. pictures of Den, Nebra. Added a label of Den. Modified the Main Page aspect. 19- Jan 2001 : Added Stone vessels inscr. pictures of Hotepsekhemwy, Khasekhemwy, Ninetjer, Sneferka, Sekhet, Bird. 17- Jan 2001 : Added a label of Aha and one of Djer. Added stone vessels inscript. images of Narmer, Aha, Djer, Khaba. 16- Jan 2001 : Added two labels of Den and a drawing of Semerhet 3. Currently updating "Aufgefasse" with images. 06- Jan 2001 : Updated the Label Corpus: Made references for Den and transferred some labels. 14-Nov 2000 : Added a note and picture of a Demotic Papyrus of Nfrkaskr ; new better picture of Qa Hdjet stela. 06-Nov 2000 : Added a new section of my brief articles, with the first one: Helwan. But this site at xoom.it remains the main one and the updated one unless xoom gives other problems. 16-Sep 2000 : Added some text and pics in Dynasty III Sanakht,Netjeryhet,Sekhemhet,Khaba. 27-Aug 2000 : Added a file for the Second dyn. ephemeral Kings Neferkara, Neferkaseker, Nwbnefer . 18-Aug 2000 : Carmen's birthday. Added some lines in Ninetjer and Gefasseaufinschriften. 16-Aug 2000 : The record of entrances in my site since the opening (Two months ago) : More than 50 hits in 2 days ! 04-Aug 2000 : In the next 3 Days I ll finish the pages on Uneg and Sened of the second dyn. 17-July 2000 : Added King NEBRA in the 'Early dynastic kings' page. Probabily in the end of July-September I' ll add the other II nd dynasty Kings.